Golf carts are available to rent at a cost of $75.00+tax for the weekend (Friday-Sunday) and $99.00+tax for Holiday weekends (Friday-Monday) Other restrictions may apply. 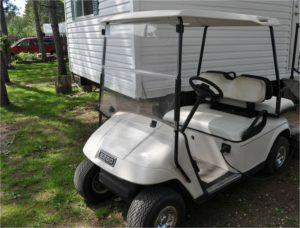 Golf carts can be purchased when you check in or online when making your reservation. Overnight guests are not allowed to bring in personal golf carts or ATV’s.